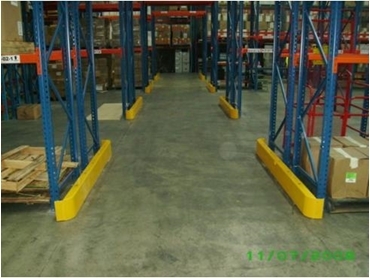 A new range of Heavy Duty Pallet Rack End Guards have been released to the Australian Market by Andian Sales . The Heavy Duty Pallet Rack End Guards are pallet rack protectors, which are proven to help prevent damaged caused by forklifts where tight access around pallet racking in factory environments is a safety issue. Andian Sales has recently installed some of the new Heavy Duty Pallet Rack End Guards in a Melbourne Express Logistics Company. The client also requested high visibility flags on fiberglass flexible poles to further assist in the prevention of accidents. The combination of the physical protection with the high visibility deterrent has proved an enormous savings in safety, time and expense.